On March 6, 2018, British journalist David Collier exposed a virulently antisemitic Facebook group, “Palestine Live,” who members have included politicians (such as UK Labour leader Jeremy Corbyn and his son/advisor), journalists, and activists from prominent human rights non-governmental organizations (NGOs). These NGOs include Amnesty International, Medical Aid for Palestinians, and Jewish Voice for Peace. 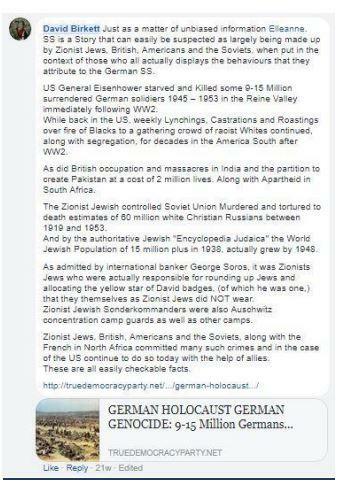 (Examples from the latter, discussed below, can be found in the second installment of his report “Antisemitism Inside Palestine Live (a Facebook Group)”.) It is likely that as more information on this group is made public, additional NGO activists will be identified. Aimee Shalan, CEO of Medical Aid for Palestinians (MAP), a group that promotes distorted and false narratives and demonizing rhetoric under the guise of medical expertise and scientific fact, was active in the group. In 2014, NGO Monitor exposed that MAP’s founder, Swee Ang Chai, disseminated a link to a David Duke video, “The Zio Matrix of Control” in a secret Google group, that also included numerous anti-Israel activists (see below). At least three officials of Amnesty International were also members, including Alli McCracken (Advocacy Director for MENA at Amnesty International USA) and Alex Neve (Secretary General of Amnesty International Canada). 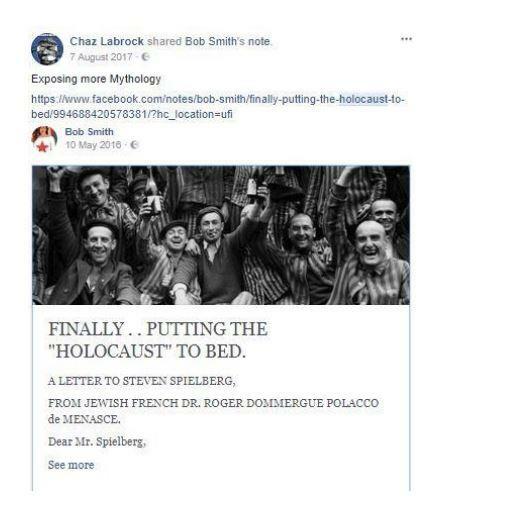 David Birkett, who describes himself as a fundraiser for Amnesty International UK, shared highly antisemetic articles and statements, including Holocaust denial in the group and on his personal Facebook page. 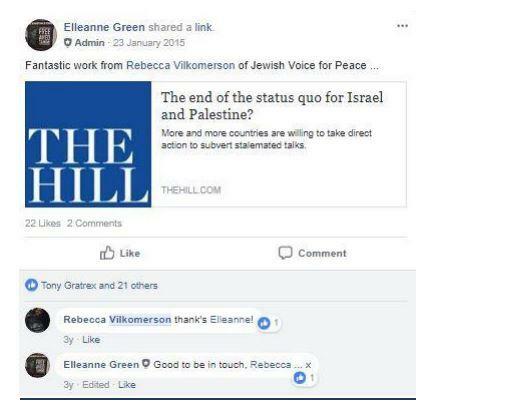 Collier notes that one of the Admins tagged Amnesty International UK crisis response manager Kristyan Benedict, who has on several occasions made antisemitic jokes and statements reflecting global conspiracy theories involving Israel, the United States, and the arms trade. This suggests that Benedict was once a member and/or is Facebook “friends” with a leader of this antisemitic group. Rebecca Vilkomerson, Executive Director of Jewish Voice for Peace (JVP), was also an active member of the group. Other NGOs whose activists are members of Palestine Live include CAABU (Chris Doyle), Electronic Intifada (Asa Winstanleyand David Cronin), CODEPINK (Medea Benjamin), War on Want (Asad Rehman), Palestine Solidarity Campaign (Sara Colbourne – former director), and ICAHD (Jeff Halper, Angela Godfried Goldstein). Avner Gvaryahu, Executive Director Breaking the Silence, appeared on the list of group members. However, he claimed that he was added to the group without his knowledge. This is far from the first case of NGO activists belonging to Facebook groups with inflammatory antisemetic content. In 2014, the Facebook page for World Council of Churches World Week for Peace in Palestine and Israel (WWPPI 2014) included postspromoting overtly antisemitic material, such as the Protocols of the Elders of Zion and and a documentary by neo-Nazi David Duke called “Israeli Genocide in Gaza.” The Facebook page also contains an antisemitic cartoon depicting Israel – with a prominent Star of David – as a snake. As of March 2018, WCC has not removed any of these materials from its Facebook page. Another secret online group with NGO activists as members, Sempre Contro la Guerra, was a forum for extremist and often antisemtic content. Dr. Paola Manduca – who is associated with the designated US terrorist entity and NGO Interpal, and headlined the notorious “Gaza letter” in The Lancet – forwarded to the group an email from Dr. Swee Ang (another author of the “Gaza letter”) with the subject line “[url=https://www.ngo-monitor.org/data/images/File/CNN Goldman Sachs & the Zio Matrix.pdf]CNN Goldman Sachs & the Zio Matrix[/url]” containing a link to a video by the American white supremacist David Duke. 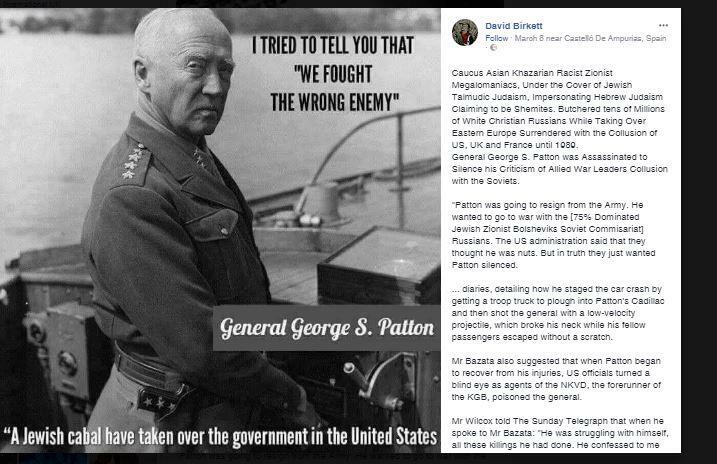 In addition to numerous other posts, she also posted an article by Paul Larudee to the group in September 2014 with the subject line “israel and parassites” (sic). The article’s main theme is that Israel, through the American Jewish community, is a “parasite” feeding off the host/victim nation – the United States – by controlling key U.S. institutions. This “Jew as parasite” theme was prominent in Nazi ideology.